After only really following rallying from a distance for years, 1995 changed all that when the late, great Colin Mcrae won the World Championship - all of a sudden the press wanted to shout about it. I've always liked cars and driving, but only once I had actually passed my test and got my first car, did I really 'get into' cars. I'm not from a 'car mad' family at all, in fact probably the opposite. Colin winning made a big impression, and set me off on the road to rallying. The man truely was a genius behind the wheel, and no doubt inspired many more people like me to have a go at the time. 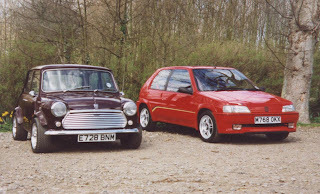 In 1996 I bought a Peugeot 106 'rallye', the little 1294cc homologation special which was the quickest car I had driven by that point. It got a little more interested in the rally world in its own way, as I found out about the Peugeot 106 Challenge run by the Peugeot Sport UK by Mick Linford/Stella Boyles from Ryton, Coventry. Bombing round my local lanes, I could see why the little Peugeot with just 1300cc was such a good class car - but rallying one seemed a bit of a big jump at the time.